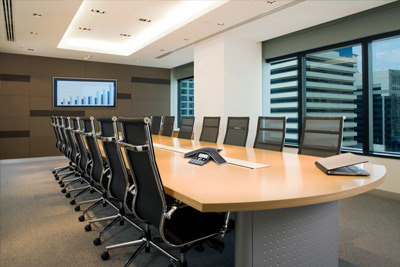 Jackson Hole AV offers boardroom design services that will set your business up with a space that speaks for itself! What makes a well-designed boardroom so important is that it represents your business and shows your potential partners and clients what you are all about and capable of doing. Having a boardroom with all subsystems controlled by a single device shows others that your business is in control, well organised and streamlined. Jackson Hole AV offers systems that can be adjusted and controlled according to your needs. Our climate controls efficiently manage the best working temperatures for optimal comfort and cost management. The lighting systems that we offer are state of the art and can be brightened and dimmed manually or with a smart phone or tablet. The blinds and shading we supply can be adjusted for the perfect coverage. Conference rooms are nothing these days without state of the art audio video systems. Meetings can be attended by people across the country and even the world thanks to conference calling- and for a successful conference call, Jackson Hole AV offers a wide range of high quality audio video systems that are easy to use and provide crystal clear images and sound. Our overhead projectors are also must haves for efficient meetings, and are easy to use and can be controlled with a convenient remote. Our technicians will install all systems quickly so that you can get on with business as usual, leaving your boardroom looking and operating better than ever. For boardrooms that really speak for themselves, call Jackson Hole AV! Call us today at (307) 733-2629 for a free, no obligation, in-office consultation.